Hive | "Why don't I write about it in my blag"
I know there hasn’t been a lot of activity here — rest assured it’s just because I’ve been having too much fun. I’ve been to cat cafés, oxygen tanks, observatories, planetariums, giant buddahs, onsens galore and still more festivals. We partied for the election and ended up drinking with mafia girls (and paying for the privilege). In the meantime I’ve been binging on nerdy internet info, avoiding becoming a part of the online skeptic community, undergoing an identity crisis as I find myself being genuinely interested in learning statistics and maths, and gently nursing the prospect of becoming an astronautics engineer. So, I’ve been kind of distracted from the ol’ blog! This afternoon, Alice & I are going on a trip around the north of Japan. We’re going to visit Osore-zan, literally “Mount Fear”. Then we’ll catch the ferry up to Hokkaido, hang around in Sapporo & surrounds for a few days, then overnight ferry back to Sendai… Then it’s time for me to come home. I don’t expect there’ll be a lot of internet connectivity around those parts, so I’ll have to do retrospective blogging. I’ve got photos and stories to tell, but they’ll all have to wait. Sendai Tanabata Festival 2010: Night 2: The Parade. Wow, am I falling behind, or what?! Way back when it was Tanabata, we saw the best matsuri parade ever. There was taiko, acrobats, and a squillion dancers. We had a great spot and it was good fun. Sendai Tanabata Festival 2010: Day 2: Lanterns, Lanterns and Lanterns. Seriously, there were a lot of lanterns. 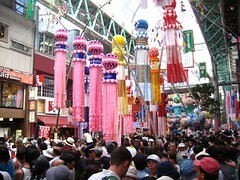 The main feature of the tanabata festival is the paper lanterns that get hung up around the city. Sendai has 2 main pedestrian malls packed with shops of all kinds, cafés, restaurants and pachinko parlours. For the festival, different organisations — whether it’s a community group, a company pretending to be a community group, or a company just flashing their brand around — make these giant paper lantern-esque decorations. I don’t really know what to call them, but they are genuinely spectacular! They’re hung from bamboo stalks high in the air draped across the street, and hang down to shoulder level. There were so many different types of lantern that it’s hard to know which ones to describe. I tried to take enough photos to give an impression of the variety, scale and colour that we enjoyed while wandering the streets, milling through the dense but well-behaved crowd. I think the crane lanterns were by far the most impressive to me – over one million paper cranes donated by people all over Japan to commemorate the 65th anniversary of the nuclear bombings of Japan. The honesty of the little handwritten sign, along with the striking beauty of the lanterns they made from the cranes, made for a really poignant memorial — a kind of bittersweet optimism. It made quite an impression. I took some video, too, which I’ll upload later on. In the meantime, soak up the pictures! Thomavalé World Tour 2010 – Part VI – Wild Horse Catching. 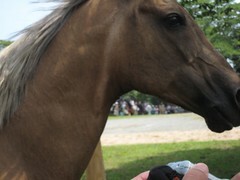 In the final segment of the epic journey that was Thomalavé 2010, we went to the Odaka “Wild Horse Catching” event. Traditionally, this was an offering of wild horses from local samurai lords to the local temple, where they would be kept as assets. The samurai would round up the local brumbies and run them up to a pen in front of the temple, where the acolytes would have to attempt to catch, halter and break in the horses. Presumably this was accompanied by a given amount of chaos, kicking and blood, from all parties concerned. Like most things here, it became something of a ritual, and has been on-going for some hundreds of years. The only problem is, even rural Japan must have run out of wild horses pretty quickly. Thomavalé World Tour 2010 – Part V – Odaka Fireworks. 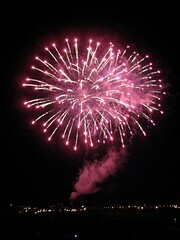 On the night of my birthday, Alice and Katie had arranged for the local government to set up a bit of a fireworks show in my honour. It was really too much of them! "Why don't I write about it in my blag"